In 1618 George Herbert wrote to his brother Henry, who was in Paris, imploring him to make the best of his time there: “Bee covetous, then, of all good you see in Frenchmen, whether it be in knowledge, or in fashion, or in words; …so shall you play a good marchant by transporting French commodities to your own country.”Meeting in the Latin Quarter, near Saint-Michel and the Panthéon, at the Universities of the Sorbonne Nouvelle (Paris 3) and Paris-Sorbonne (Paris 4), our Paris Conference encourages papers that will examine the knowledge, the ideas, the words, and even the fashions that the Herbert family members looked to import from the Paris region or from France, and beyond that to the Herberts, Europe, religion and the arts. We are seeking proposals on aspects of George Herbert studies, focusing on his poetry or prose. Papers may consider historical, cultural, and discursive contexts for his works, examine rhetorical or lyric strategies afresh, or explore previously unknown or overlooked facets of Herbert’s work and his relationship to both people and topics in the seventeenth century. We welcome proposals from both established scholars in the field as well as newcomers to the George Herbert Society and graduate students. Topics of interest will include Herbert's ties to Paris and the European continent, Herbert and the Baroque, Herbert and continental poetry, Herbert and the French Reformation, Herbert and Francophilia/Francophobia, Herbert and language(s), Herbert and translation, Herbert and war, Herbert and the Psalms, Herbert and books, Herbert and music, Herbert and pleasure, Henry Herbert, Edward Herbert and French Philosophy, Edward Herbert and his ambassadorship in France, and more. 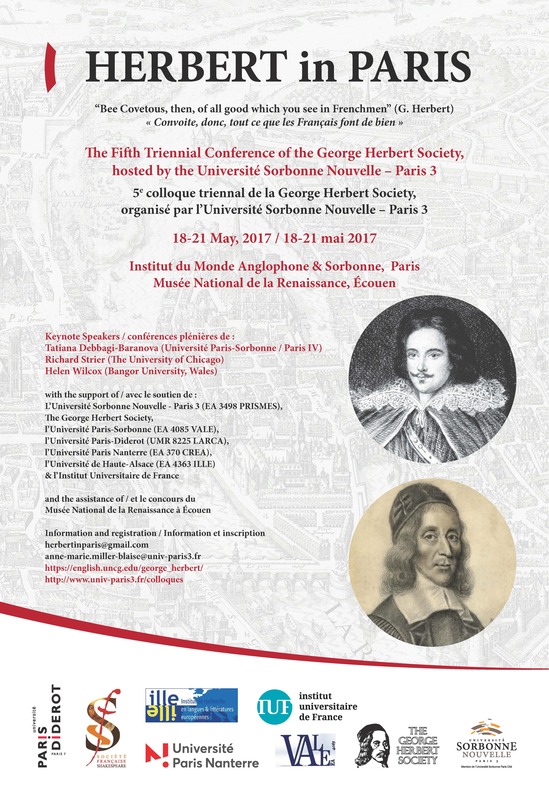 We also invite proposals for papers on French poets who resonate with George Herbert’s style, faith, epistemology, or aesthetics and a panel dedicated to discussing George Herbert’s “The Forerunners.” Proposals may be in either English or French as we hope to bring out the European dimension of Herbert’s sources of inspiration. This list is not intended to limit the scope of papers, but to suggest directions. We hope to be inclusive. Abstracts in English or in French of no more than 300 words accompanied by a brief CV should be sent to the conference organizers at herbertinparis@gmail.com, by July 15, 2016. Notifications of acceptance: September 15, 2016. Early submissions are welcome! Anyone may submit an abstract, but only members of the Society may deliver a paper. Information regarding accommodation and registration will follow in the fall.